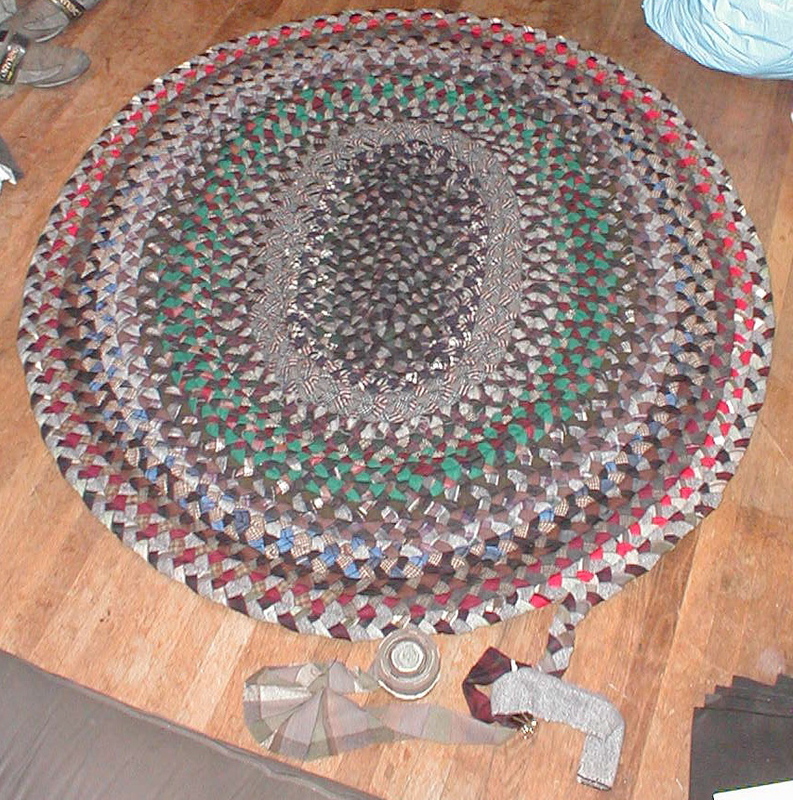 the big open space in the middle of my room has needed a rug for a while, so i decided, true to form, that id make one myself. 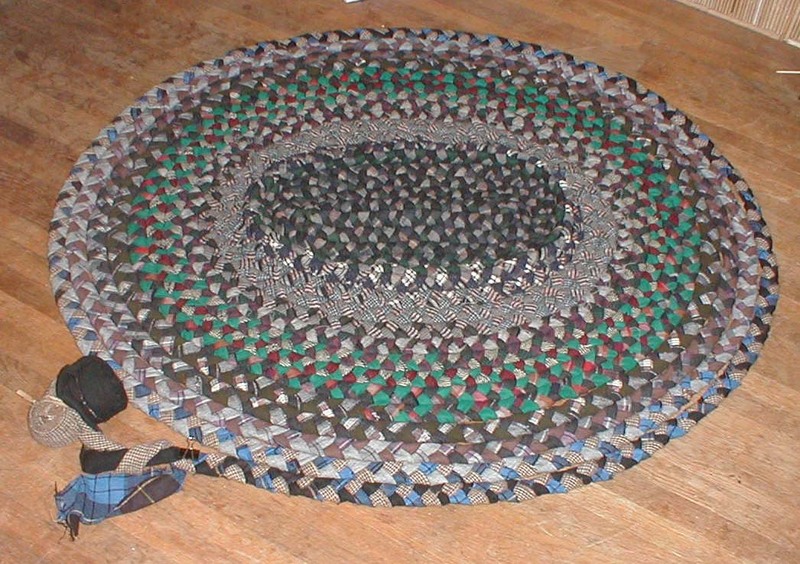 being a sucker for "recycling" of sorts, and for old-fashioned things, i chose to make a braided rug out of whatever woolen fabrics i could scrounge up from thrift stores and whatnot. some people like to approach these with an eye for color combinations and whatnot - me, i prefer the random approach - whatever i find is whatever color things end up being. i started out with a batch of fabric from the goodwill as-is store, and it neatly broke down into 2 color ranges: black/grey/white, red/brown/orange/yellow, and green/blue/purple. 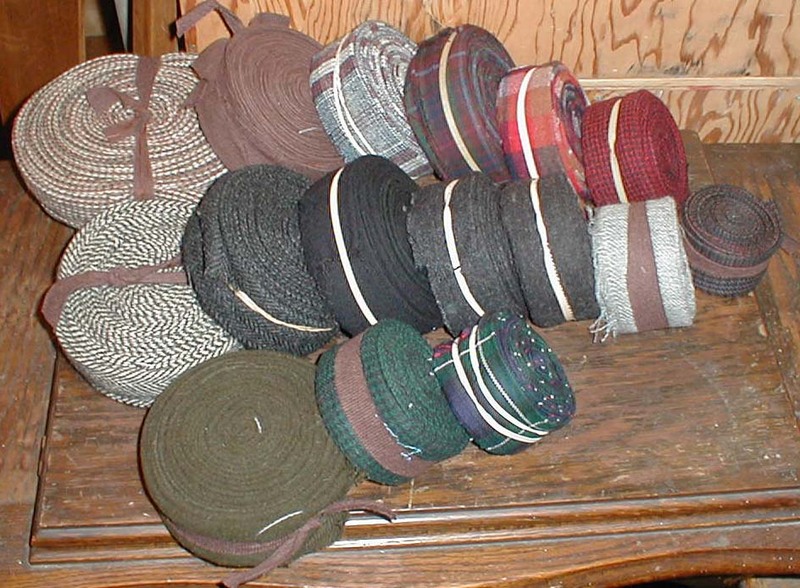 each of these color ranges would be a strand of the braid. 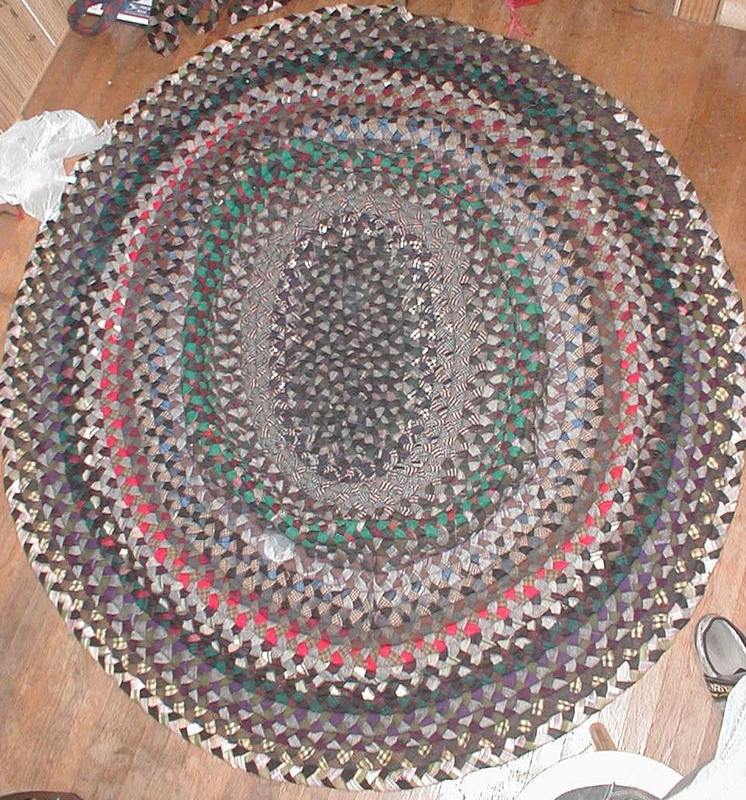 my room has enough space for a 7' x 6' rug, so thats the dimension i set out for. id never made one of these before, but the premise is simple enough, and becomes even easier if youre not so concerned about the finish woork being perfect. the hardest part, really, is to keep it flat. 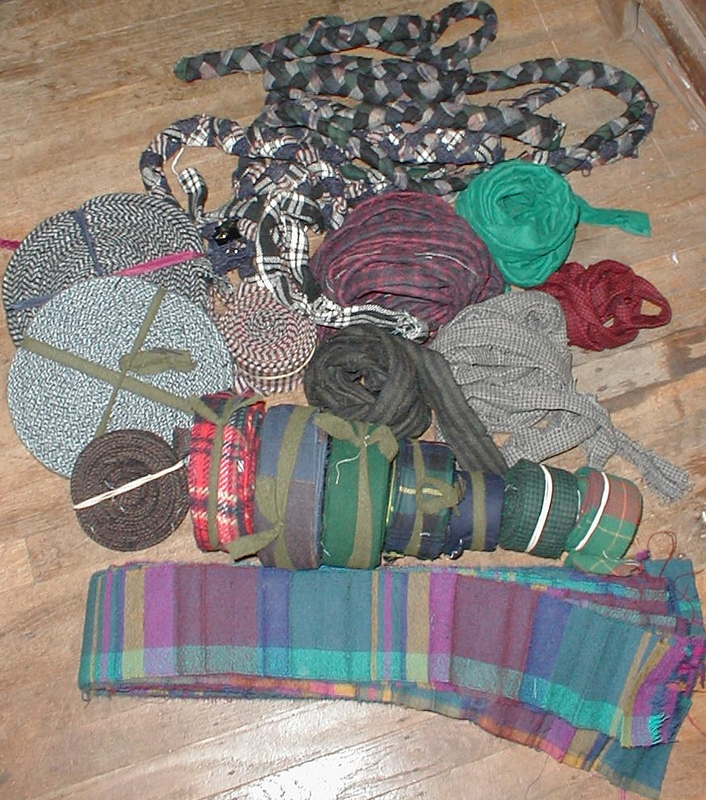 generally these pics are taken whenever i reach a stopping point, usually by running out of a given color of wool, running out of fabric altogether, or running out of thread to sew the braids together with. 01 Nov 2003 a good start to things. 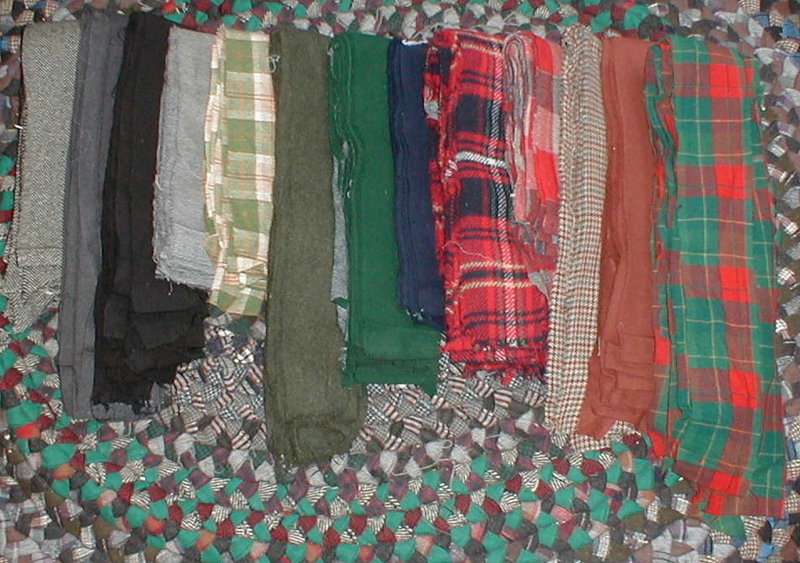 heavy on the green/blue plaids and the black, w/ a rust/grey plaid. 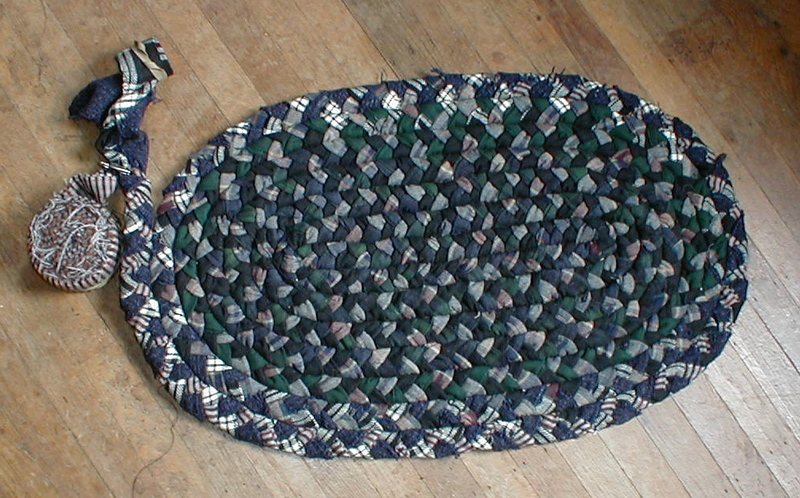 size: 1' 9.5" x 9"
02 Nov 2003 started a little bit of variation - some scraggly blue fabric, a nice black/white plaid, and a brown/rust/white stripey material. 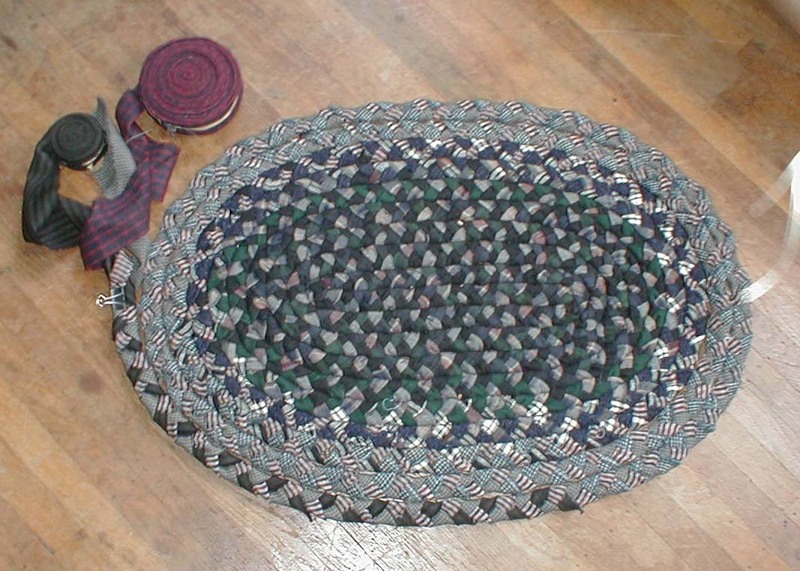 most info ive read has recommended against plaids because they make the rug too "busy", but i think they work nicely. size: 2' 2.5" x 1' 2.5"
09 Nov 2003 an unfortunate combo with the aforementioned rust/brown/white fabric and some blue/white harris tweed results in an american flag-esque bit. erk. i do like the texture of the harris tweed, though. 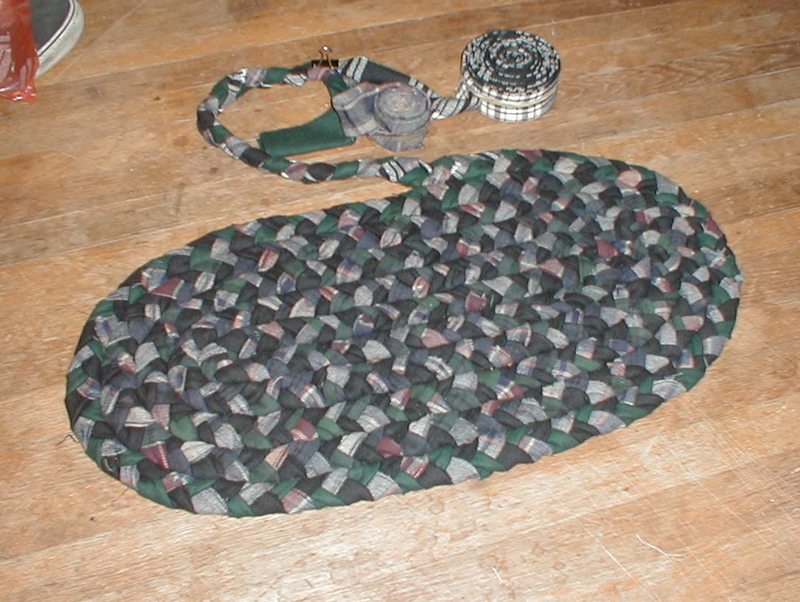 red enters the picture, and this nice dark grey/green stripey fabric, which doesnt show up that well. size: 2' 7" x1' 9.5"
22 Nov 2003 the stash of fabric pre-thanksgiving, all rolled up and ready to go. 30 Nov 2003 succumbed and bought a yard of green fabric, cause material of that color wasnt popping up in the thrift stores. at first the green looked to be a bit bright, but mellows out when surrounded by other colors (see below). 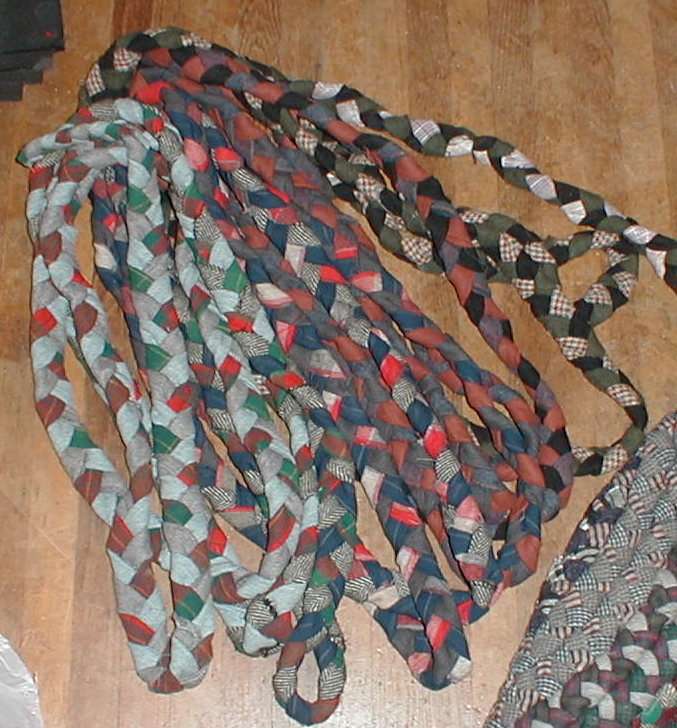 braided a whole ton of fabric over the thanksgiving weekend. 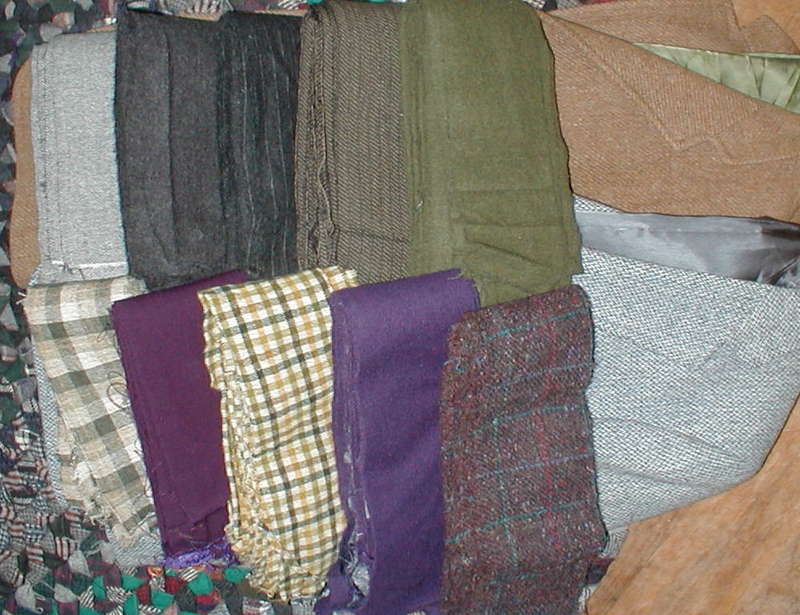 nice blue/black and grey/purple plaids at an out-of-town thrift store, and some more harris tweed, grey herringbone and brown/white. 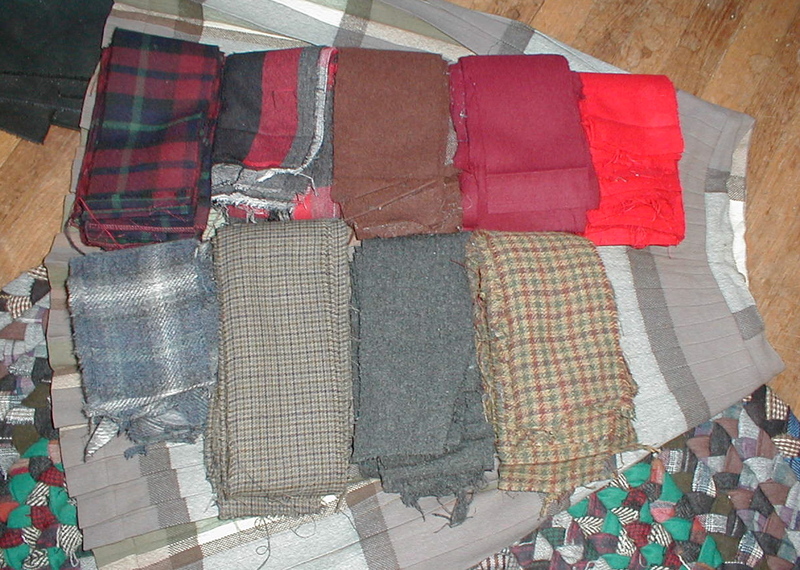 alos a nice deep rust/grey/black plaid, and nice olive and red-brown solids. size: 3' 7" x 2' 10"
30 Nov 2003 mock-up of the rest of this weekends braiding. ran out of carpet thread, so this was the best i could do with the massive amount of braid still left when the thread ran out. you can just see where i goofed a little around 09 Nov and ended up with a loose coil at about the 5th/6th coil, causing the rug to buckle at this point. i thought it would work itself out, but i was wrong. 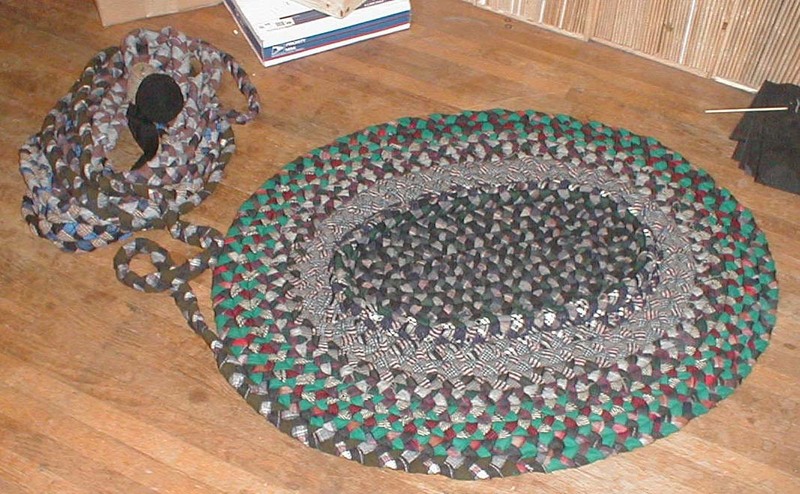 ive let it go too far now to undo all the coils, but instead ill just cut one coil out at that point in the rug. im ho[ing that will work. size: 4' 10" x 3' 9.5"
04 Dec 2003 ta da! 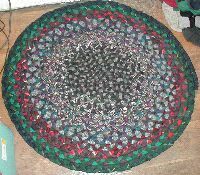 ok, not really the rug, but this is the little chair pad i made with the coil that i removed from the rug, so its *kinda* part of the rug... right? 05 Dec 2003 the take from todays run to the fabric mines. LOTS of red. a goldmine, in fact. but not nearly enough green/blue, which is what i really needed. *and* this yellowy not-quite-categorizable fabric that doesnt seem to belong to red or green... and a pendleton reversible skirt that just might be too complex to take apart, despite it having great color... anyone need a really well-made skirt? 06 Dec 2003 man, im set with the red. got a nice brown > maroon > red fade happenning. 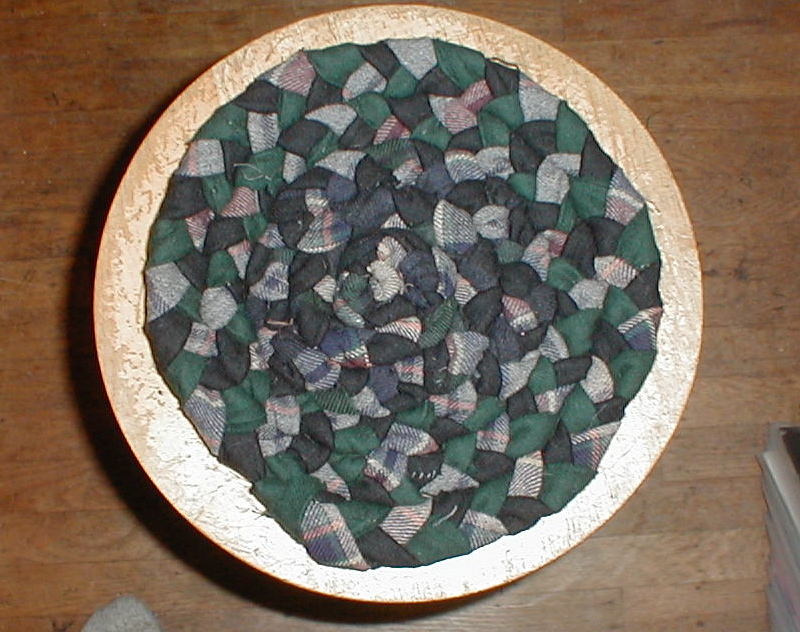 ran out of green/blue again, of course - but that weird yellow-green plaid worked nicely enough. 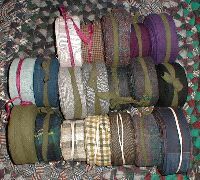 the big roll of herringbone is the last of the grey too, but thats got a while. got 3 rolls of red plaids to go, though. still a ways to go before its finished! a little lumpy, but thatll flatten out in time. size: 5' 1" x 4' 4"
size: 5' 4" x 4' 8"
12 Dec 2003 todays as-is trip - lots of green, some surprise purple, a little bit of grey/black, and only the tiniest smidgen of brown/red. 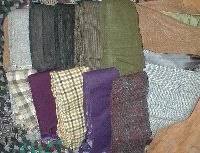 everythings all torn into strips except the 2 harris tweed coats underneath. more fabric hunting tommorrow, i think. 14 Dec 2003 2 more as-is trips, and heres the haul for the weekend. 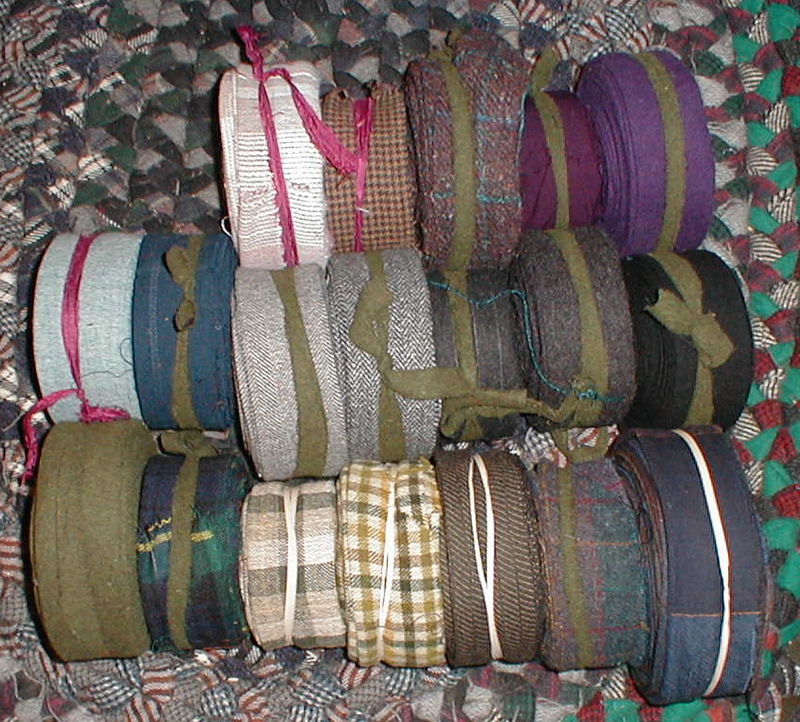 9 rolls of green/blue, 5 rolls of gray/black and 5 rolls of red/brown/purple. ill probably launch into these during the week, but i still need more grey (easy) and red (not so easy). ill do one more as-is run next weekend to fill up before xmas so i have stuff to work on then. 20 Dec 2003 well, i think this is the final run. im pretty sure ive got enough with this stuff and the last weekends haul (which has already started to be braided in) to keep me fully occupied for a while, and finish out the rug, if not to its intended 7' length, certainly close enough. if i cant get to 7' with this haul, ill just stop wherever this takes me. size: 6' 5" x 5' 9"
28 Dec 2003 the last of the braid! 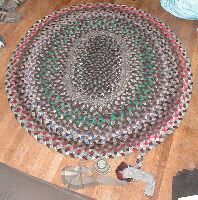 this is enough to do about 3 more coils, and this rug is DONE! 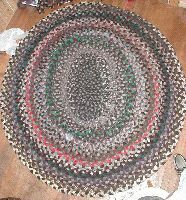 02 Jan 2004 well, i stitched all the remaining braid on to the rug, and now ive started the reworking of the center to get rid of the lumpiness. interestingly enough, after unraveling almost out to the red bits, and then starting to stitch backwards, im ending up with a lot of extra material. a LOT. like tons. ive mocked it up a bit, and i figure i wont even finish out the green section before the hole you see is closed! yikes. 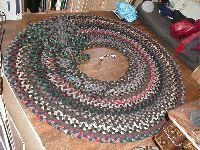 that means ill have the braid left over (notice the *very* large pile on top of the rug...) to rebuild the rug as shown on 09 Nov 2003! nutty. 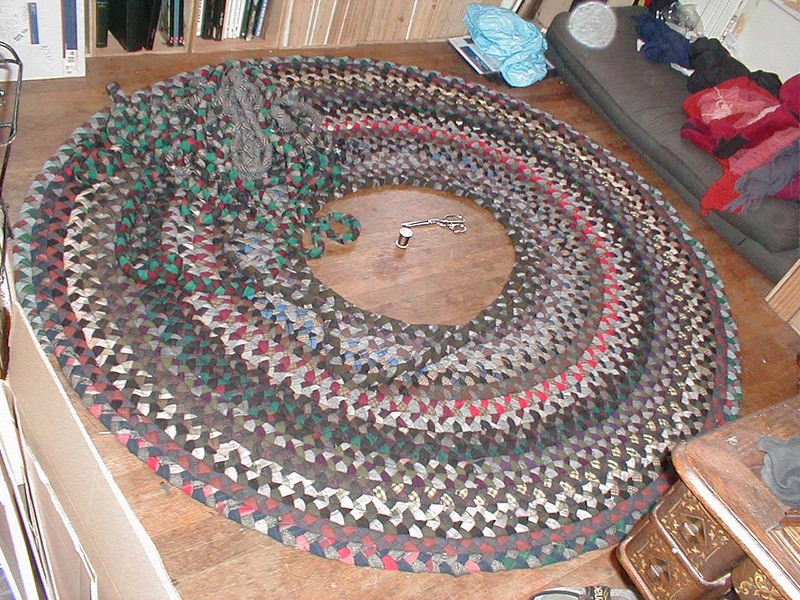 space-time continuum is obviously warping in this rug. but whats cool is that this will free up a nice blue check harris and a black/white large herringbone harris for use in my continuing harris tweed projects. more in a bit once i get this finished! yes, i said FINISHED! 01 Jan 2004 VOILA! new years resolution #1 accomplished! im off to a great start! 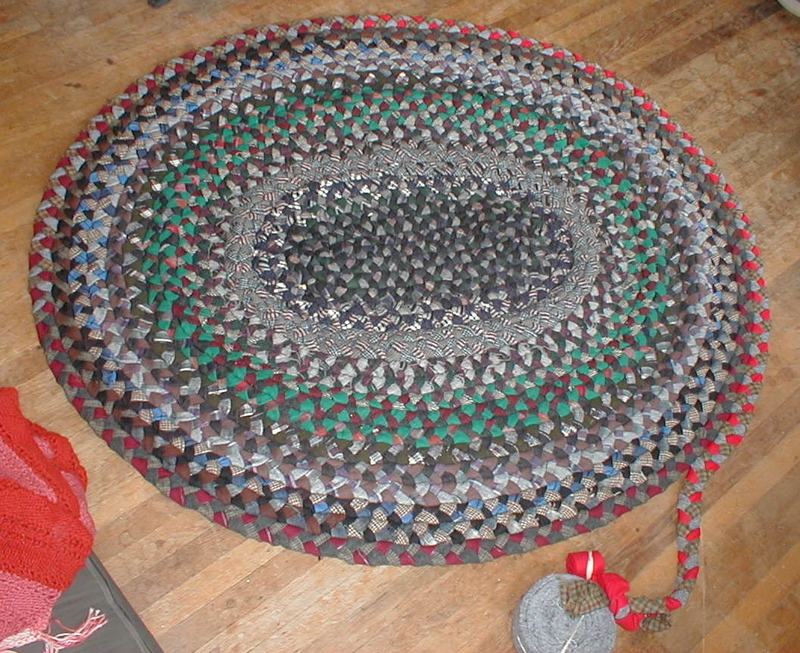 weird how ive now got like 40 feet of extra braid... itll get recycled somehow, into a smaller rug. but this one turned out great! im pretty damn pleased with it. fills the space i had wanted to fill, and fills me with one of those handy senses of accomplishment. nice. 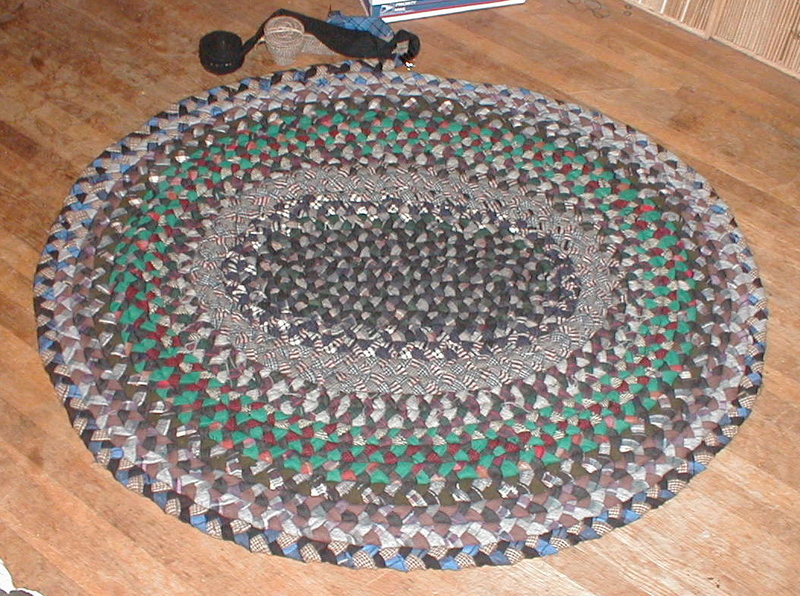 finished size: 6' 11" x 6' 4"
03 Jan 2004 yes, i said finished... heres the awful truth, the leftovers from the above rug. 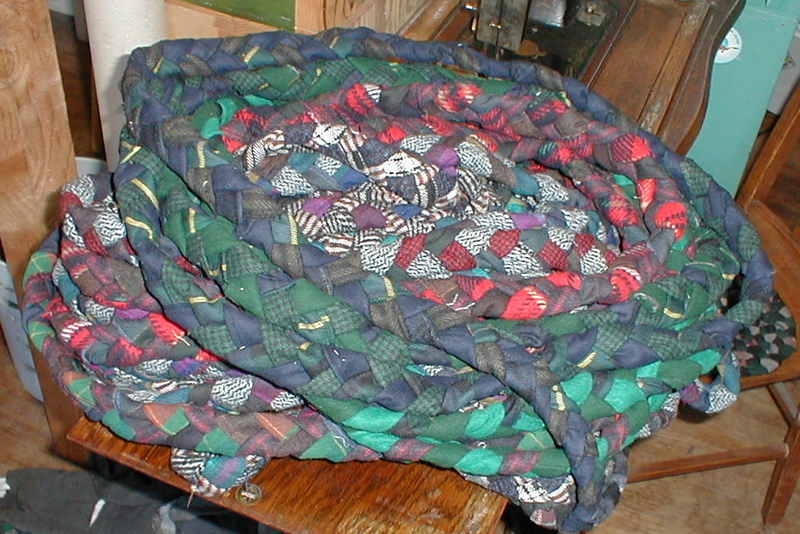 17 total leftover rolls, unsewn strips, unravelled colors etc. 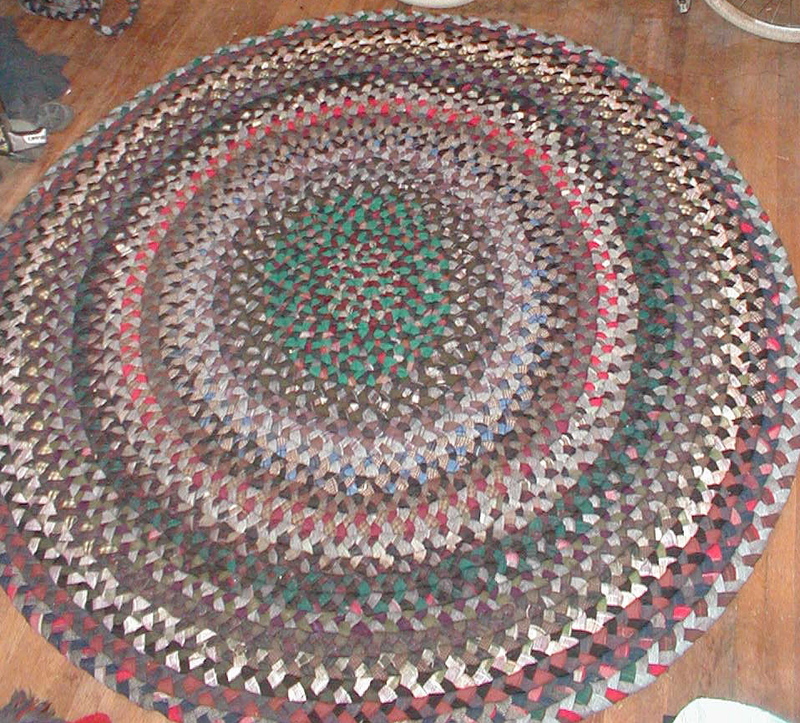 truth be told, i think i have enough left to make another rug about 4' x 3'! which is nice, cause itll be perfect for the doorway of my room. theres gonna be some interesting color combinations, cause i have no intention of finding further fabric for this project, so ill be unable to stick to the original pattern of having each part of the braid stick to a certain color range. that purple/teal/blue/orange/etc plaid is garish, eh? cant wait to use it, cause its gonna be a hugely long roll. i think theres something in there to clash with every color i could possibly use. beautiful. 04 Jan 2004 ok, so thats the last of the fabric leftovers. all thats left to do now is coil and sew. 04 Jan 2004 and here it is! 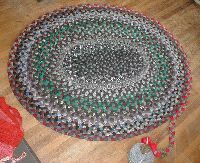 SON OF GIANT RUG! turned out pretty good. a little lumpy, but i wasnt as concerned about that this time. more color this time around, cause there wasnt really any grey/black left. 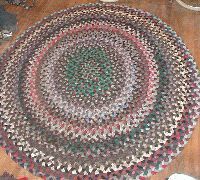 but still the variegated-ness of this type of rug just seems to mellow out the colors, even in the case of that purple-orange-green-blue plaid. this one will greet my feet when i come out of the loft in the morning. that much nicer than cold floor. 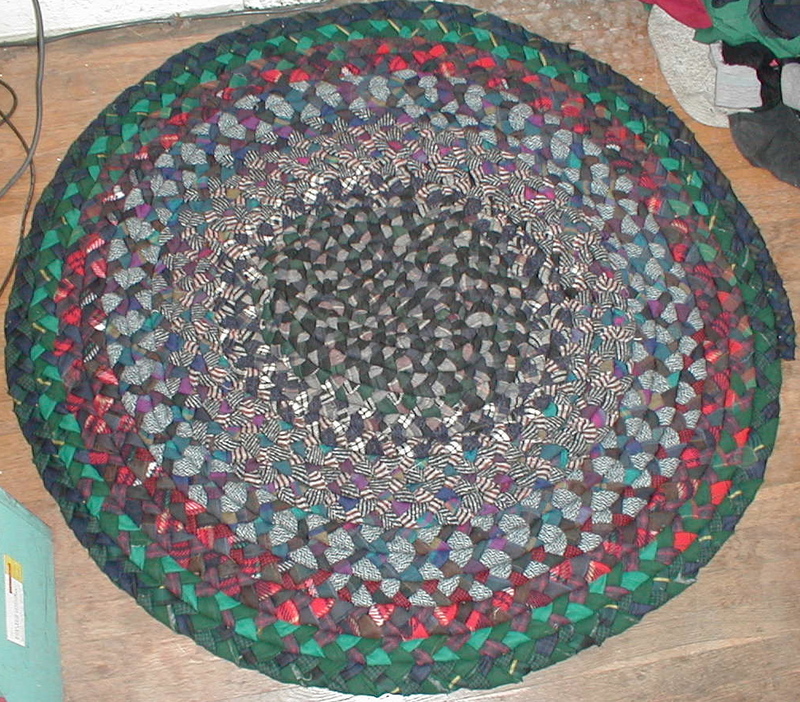 finished size: 3' 10" x 3' 9"